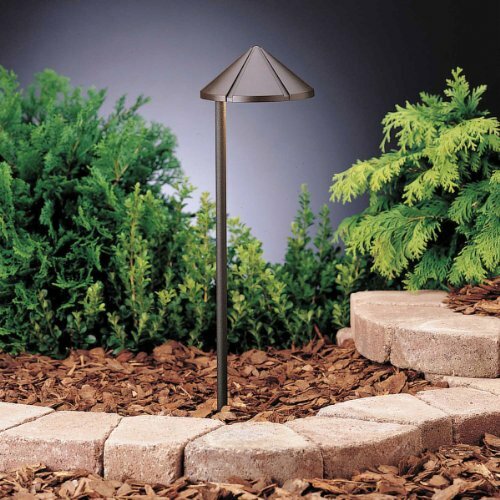 The Kichler Lighting 15315AZT6 Side Mount 1LT Incandescent/LED Hybrid LV Landscape Path & Spread Light comes in a pack of 6, and is a basic, uncomplicated design in a rich Textured Architectural Bronze finish for versatility in any setting. Use along walkways or points of interest for classic charm that will be appreciated in any outdoor décor for many years to come. The 15315AZT6 are 20IN tall x 6IN in diameter, and are installation-friendly with included 8IN in-ground stakes, 35IN of usable #18-2 SPT-1-W leads and cable connectors. The 12V S8 wedge base fixtures include six (6) 24.4W 3156K Krypton lamps, emitting light without troublesome glare or hot spots. Highly Energy Efficient LED lamps are available as well, and can be purchased separately, that can be used in place of the included Krypton lamp. The LED lamps are offered in different color temperatures (2700K, 3000K, & 4200K), giving you maximum control over the look you desire. To determine the size of transformer you will require, multiply the fixture VA (24.4) by the number of fixtures you will be using. Optional mounting accessories are available for surface mounting with junction box (15601) and tree/surface mounting (15607), and can be purchased separately. The 15315AZT6 comes six (6) per package. LEDs are free of infra-red or ultra-violet rays, are cool to the touch, and will not damage those special objects showcased under these lights. LED lamps provide 30,000 – 50,000+ hours of lamp life and perform virtually maintenance free for years. The result: 80% less electricity used, lower energy costs, easy maintenance, and exquisite style. Since 1938, Kichler Lighting has offered a distinctive array of lighting solutions that reflect your individual personality, tastes and plans. Kichler brings you an unparalleled variety of exciting style families, unique finishes, fresh colors and unequaled quality. Whether it's casual, contemporary, transitional or traditional, you'll find it with Kichler, lighting that defines your style. If you have any questions about this product by Kichler Lighting, contact us by completing and submitting the form below. If you are looking for a specif part number, please include it with your message.